Whether you’re driving a tractor or combine, grain truck or just going down the road in your pickup, you need both hands on your controls and not fumbling with your cell phone or handheld computer. We sell RAM cradles and mounts that give you easy access to your device but stand on their own. This is just a sampling of the many options we have to offer so give us a call, tell us what vehicle you drive and what you want within easy reach and we can get you set up. New! Ram X-Grip for your Cell Phone or Tablet! The new RAM X-Grip III™ line of products just got bigger and better. This new model is just what you’ve been looking for to hold your favorite tablet. Just like the devices it was made for, it is everything you need and nothing you don’t. Simple to open and close, the spring loaded RAM X-Grip III™ leaves the outside edge of your tablet almost completely free of annoying obstructions. Soft rubber fingers apply just enough force to keep your tablet in safe and secure. Compatible with a wide range of mounting solutions, your tablet is sure to find a home no matter where your travels take you.The RAM-HOL-UN9U consists of a composite spring loaded holder, expandable grip arms and additional bottom support keeper. Included are extra easy access grip knobs, located on the back of the holder for quick release of your tablet. The RAM-HOL-UN9U expands and contracts for perfect fit of most 10″ tablets with or without sleeves, as well as some smaller tablets. Please verify dimensions of your tablet below for compatibility with the X-Grip III™. Buy RAM-HOL-UN7BU Universal X-Grip™ Cell Phone Holder with 1″ Ball. Requires additional arm and base. Sometimes, its all about the design. If you are looking for a compact mount for your cell phone without that cookie cutter shape, you’ve found it. The RAM X-Grip™ has a clean and clever four leg design that sports great holding power without hiding your phone behind foam pads and plastic. The perfect compliment to the modern sleek interior of today’s vehicles, the RAM X-Grip™ is the cell phone holder evolved. Compatible and interchangeable with a wide range of popular RAM Mounting products, this elegant holder is ready to compliment your phone and become the most useful accessory in your vehicle. The RAM-B-166-UN7 consists of a 3.25″ twist lock suction cup base, double socket system and universal spring loaded X-Grip™ holder for cell phones. The suction cup, twist lock base is designed to have a strong hold on glass and non-porous plastic surfaces, including RAM adhesive disks. The mount is designed with a RAM 1″ diameter patented rubber ball and socket system that has adjustment points at both ends of the double socket arm; this allowing for almost infinite adjustment and perfect viewing angles. The included X-Grip™ cradle has a clean and clever four leg design that sports great holding power without hiding your phone behind foam pads and plastic. The spring loaded X-Grip™ holder expands and contracts, allowing for a perfect custom fit of your cell phone. The perfect compliment to the modern sleek interior of today’s vehicles, the RAM X-Grip™ is the cell phone holder evolved. The RAP-299-3-UN7BU consists of the RAM-A-CAN™ cup holder base, double socket system and universal X-Grip™ holder. The mount is designed with a RAM 1″ diameter patented rubber ball and socket system that has adjustment points at both ends of the double socket arm; this allowing for almost infinite adjustment and perfect viewing angles. The included X-Grip™ cradle has a clean and clever four leg design that sports great holding power without hiding your phone behind foam pads and plastic. The spring loaded X-Grip™ holder expands and contracts, allowing for a perfect custom fit of your cell phone. The perfect compliment to the modern sleek interior of today’s vehicles, the RAM X-Grip™ is the cell phone holder evolved. Buy RAM-HOL-TAB3U Tab-Tite Universal Clamping Cradle for the Apple new iPad, iPad 2 & iPad 1 WITH OR WITHOUT CASE, SKIN OR SLEEVE. Arms and bases additional cost. 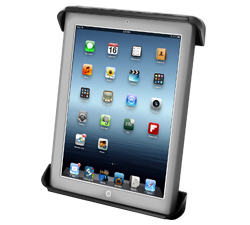 Get the most out of your iPad with the RAM Tab-Tite™ spring loaded, quick release cradle. With interchangeable cup ends, you can fit the cradle to your iPad for a near custom fit. This spring loaded design makes it easy to load and unload your iPad, along with keeping it secure while on the go. Cup ends are designed to optimize the functionality of your iPad, allowing access to audio jacks, usb, power, and other ports, your iPad can be used just as it was intended. Perfect for stationary or on the go applications, this new RAM product is just what you need to get the most out of your iPad. The “U” in the part number reflects product packaged in poly bag. Hardware included to attach to mount. The RAM-HOL-TAB3U is not compatible with the Apple iPad WITH LIFEPROOF CASE. The “U” in the part number reflects product packaged in poly bag. The cradle includes a set of four nuts and bolts to connect the cradle to any of the RAM compatible mounts. RAM cradles do not include the RAM-B-202U (Round Base & Ball), required to attach to the cradle and RAM mounting system. The small side clamping cradle is designed to hold a large amount of different kinds of cell phones and small electronic devices. This cradle has padded locking side clamps that close tightly on the item you want to hold. To release the clamp hold, simply press the button found at the bottom left side of the cradle which will spring the clamps open. At the base of the cradle are two small supports to hold the bottom of the item securely in the cradle. The “U” in the part number reflects product packaged in poly bag. If you require a different sized clamping cradle please look at the RAM-HOL-UN2U, RAM-HOL-UN3U or RAM-HOL-UN4U. RAM cradles do not include the RAM-B-238U (Diamond Base & Ball) or RAP-B-238U (Diamond Composite Base & Ball), required to attach to the cradle and RAM mounting system. The RAM Composite Universal Finger Grip™ Holder is designed to hold a large amount of cell phones and electronic devices. The holder comes with (3 sets) of four flexible rubber coated fingers placed along sides to grip your device. The fingers open by squeezing the ends to open the small finger arms. The bottom of the holder includes a back plate that adds support to the device being held by the mount. The perfect solution that is the best phone mount, car mount, motorcycle mount and can be used with several other phone accessories including samsung accessories and lg accessories. The spine plate contains the universal AMPs and 1.5″ x 2″ hole patterns. The “U” in the part number reflects product packaged in poly bag. RAM holders do not include the RAM-B-238U(Diamond Base & Ball) or RAP-B-238U (Diamond Composite Base & Ball), required to attach to the holder and RAM mounting system. Buy RAM-HOL-UN5U Medium Size Universal Spring Loaded Clamping Holder with Rubber Clamps for Cell Phones, iPhones & iPods. Requires additional Arm and Base. The RAM universal spring loading clamping cradle includes side clamps with rubber bumpers that adjust accordingly to the width of your device, securing your device in the cradle. The feet at the base of the cradle can pivot and slide, creating an opening for larger devices to be attached. A release button, located on the bottom right side of the cradle, allows for quick release of your device. Also included are two threaded inserts and a set of two nuts/bolts to connect the cradle to any of the RAM compatible mounts. Primary mounting applications for the clamping cradle is in LOW VIBRATION environments including cars, trucks and fleet vehicles. The “U” in the part number reflects product packaged in poly bag. RAM cradles do not include the RAM-B-238U(Diamond Base & Ball) or RAP-B-238U (Diamond Composite Base & Ball), required to attach to the cradle and RAM mounting system.